In the early 1980’s, as Anderson was beginning to grow, a group of theatre lovers at Anderson Community Theatre (ACT) began discussing the possibility of starting a new and different “alternative” black box theatre. After many meetings, and a lot of hard work, Electric City Playhouse was formed and incorporated on February 14, 1984 as a non-profit organization. The Arts Center provided an umbrella for ECP during the formative months. Our objectives were to provide an alternate theatre with more contemporary productions, to offer children exposure and education in theatre arts, and to showcase local talent. Our first home for the playhouse was in the basement of the old Gene Anderson building downtown. The headspace was a mere 10 feet and the actual auditorium space was only 24 feet wide, so we could only seat 77 people – 7 rows of 11 seats each. On November 11, 1984, our facility was christened with a production of Side by Side by Sondheim. Roz Silverstein, Gloria Edwards, and Jim Chisman were the vocalists, Leroy Dorr the narrator, and Beverly Henderson was the pianist. We adopted the calendar year as our season year and during 1985 we presented Bus Stop, The Dining Room, Vanities, and a show written by local author Hurley Badders, Reflections, which won an award from the state historical association. We added a children’s production, allowed Clemson University to use our space to present an original play by Robin Roberts, and provided a showcase opportunity for a group of singers called The Mansfield Ensemble directed by Leonard Johnson. This increased activity earned the theatre the South Carolina Theatre Association’s Founders Award, presented annually to the individual or group that makes the greatest contribution to amateur theatre for that year. In 1990, the search for a more satisfactory space for our theatre began. In 1991, under the leadership of Ruth Ann Terry, the new season opened in our current facility at 514 North Murray Avenue. 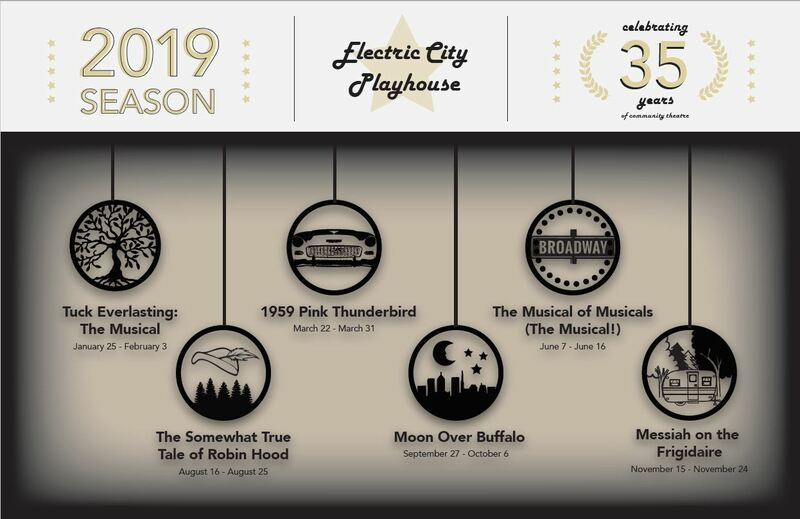 Electric City Playhouse is proud to present six season shows each year, along with Special Event Fundraisers, and a great, two-week children’s youth drama camp and production. We are a vital part of the Arts in Anderson and partner with other non-profit organizations, such as the Cancer Association of Anderson, The Rotary, The Marine Corps League of Anderson, the Alzheimer’s Association, and the Children’s Miracle Network in their fundraising efforts.